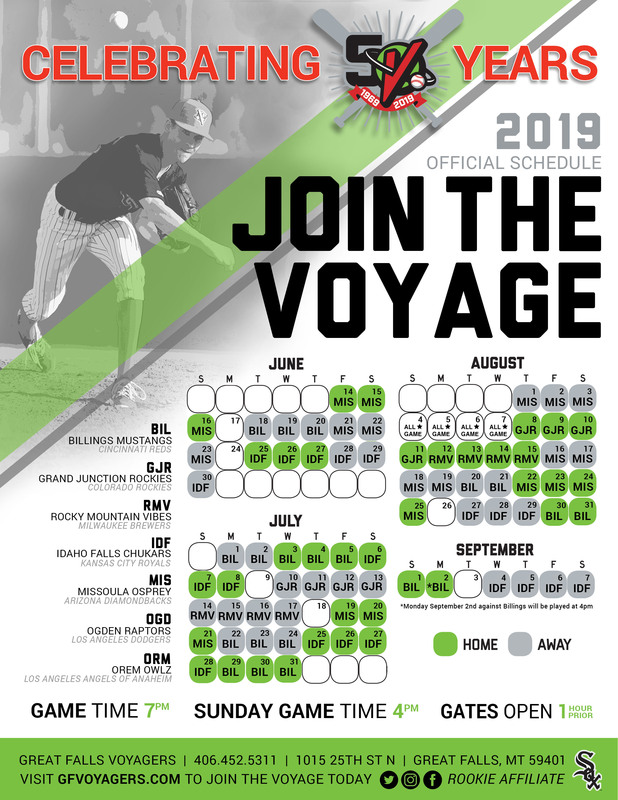 Join the Voyage this week as the Voyagers get back into Great Falls for a seven game home stand starting Tuesday, July 10. It will be the first time that the Southern Division comes to play in Great Falls for the 2018 season with the Orem Owlz and the Grand Junction Rockies coming to visit. To start off the home stand on Tuesday, Black Eagle Community Center is sponsoring a Bowling Coupon Giveaway. They will have bowling coupons to give out as you enter the stadium, as well as special Black Eagle Community Center giveaways throughout the night. Tuesday is also Jeremiah Johnson Brewing Company night with special discounts on Jeremiah Johnson beer. Wednesday is our Sandlot Movie Night, sponsored by the Heisey Youth Center. After the game, all fans will be invited out to the field to watch The Sandlot. Concessions and Beer stands will remain open after the game is over throughout the movie. Wednesday night is also Make Every Wednesday a Holiday Night, sponsored by Holiday Station. Ladies Night will highlight our Thursday at the ballpark, sponsored by Benefis. Not only will all ladies get in for free on this night, but the first 200 will also receive a stemless wine glass. There will be a voucher given to the first 200 ladies to pick these stemless glasses up as they leave the game. Thursday's are also our Sip N' Dip Lounge Thirsty Thursday's with discounted domestic draft beers throughout the night. Friday is Bank Night, sponsored by Local Participating Banks. Friday night our Farmer's Market Friday, who will be giving out special giveaways and coupons throughout the game. Saturday is our Russell Country Federal Credit Union Jersey Auction Night and Kids Shirt Giveaway. Proceeds from this year's Jersey Auction will be going to CASA - CAN. Jerseys are given to the winners off of the players back after the game on Saturday. All kid's shirts given away will look just like the jerseys that they players will be wearing. Saturday is also Twisted Tea Saturday, and will feature discounted Twisted Teas. It is our Selfie Stick giveaway day on Sunday, sponsored by The Great Falls Clinic. The game will start at 4 p.m. and will be your chance to take a selfie with some of your closest friends! Sunday is also Kids Eat Free day sponsored by the Great Falls Tribune and Pepsi. To round out our home stand, on Monday, July 16, it is Discounted Madness Night, sponsored by Teriyaki Madness. Come try out our newest stand in the ballpark with special discounted pricing. Monday is also our We Win, You Win, sponsored by McDonalds. If the Voyagers win, everyone will go home with a coupon from McDonalds. If you haven't purchased your tickets for this week yet, please visit our website at gfvoyagers.com, give us a call at 406-452-5311, or stop by Centene Stadium to purchase your tickets.